Identify risk areas that need improvement. Our security experts will review your policies, scan your network for vulnerabilities and even give you a risk scorecard, all in a nice summary report of our findings. Identify security risks before it's too late with our FREE Security Assessment. Just fill out the form to the right and we'll get started! Our security experts will interview you about the policies and controls in place today for keeping your data and network safe. Next we run a scan of your entire network system to detect any areas where your data might be at risk. We generate a detailed risk report card that shows you what parts of your network infrastructure are at different levels of risk. We package all our findings up in a useful written summary report on the status of your organization's security. Our customers benefit from a rich set of features that let them interact with their audience at every step of the way, introduce new demographics, and reach their target audience globally. And the awards we reap. 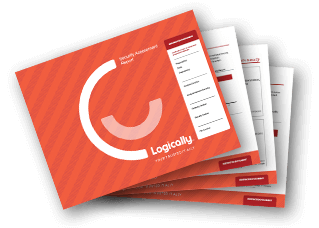 At Logically, we make IT management easy and secure for hundreds of corporations, healthcare organizations, nonprofits and public sector agencies. We partner with leading technology organizations so we can serve our clients no matter what their needs. Want the peace of mind that comes from knowing your systems are secure? Don't see what you need? Let's put together your solution now - Let's chat about it.